Holy Week can be considered the most important of all religious commemorations in the Catholic faith. 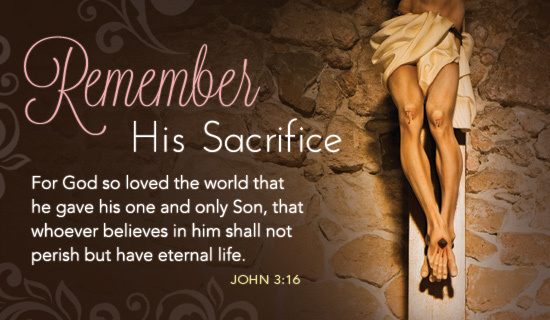 Here we recall and honor and are thankful for the sacrifice of Jesus Christ in the name of His Love and the forgiveness of the Father. As we observe these blessed days of penance, let us look at our lives and reflect on how we have lived and if we have been living it as a proper Christian should. Because being a Christian is more than attending mass on Sundays and other holy days of obligation; it is about living the gospel daily. Being a Christian is more than going to confession to tell the priest that you have sinned and to receive penance and absolution; it is about ourselves being forgiving of others and their shortcomings. Being a Christian is more than commemorating our holy saints’ feast days with good food and revelry; it is about bearing witness to the Faith as the saints have done and been martyred for. Being a Christian is more than receiving Holy Communion in the form of bread and wine; it is about receiving the Lord in our hearts and in our lives every instant, not just at Mass. Being a Christian is more than giving up what we want most during Lent as abstinence; it is about sacrificing our time, our money, who and what we are in order to serve others. Being a Christian is more than just outward practice that we have gotten used to because we were taught to do them since we were young; it is being kind and compassionate and loving. On Easter Sunday, let us leave the bad deeds at Calvary and offer our good deeds to glorify the Lord. Let us live lives from thenceforth as a living, breathing example of Christianity. Have a meaningful and blessed weekend! Thank you pod kaayo Ga. I thank the Lord everyday for this blessing of a Chiqui in my life. Hugs, nyora! Labyu mucho! Amen, mare. God bless you more.